The past two Octobers, we have visited a scenic nursery in southern New Hampshire. 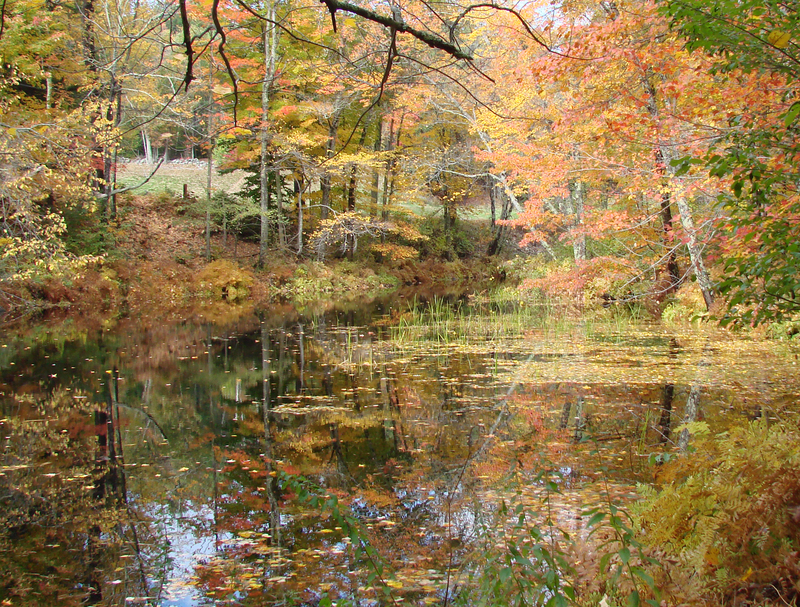 A river flows through the site, and provides a nice spot for a fall foliage photo opportunity. 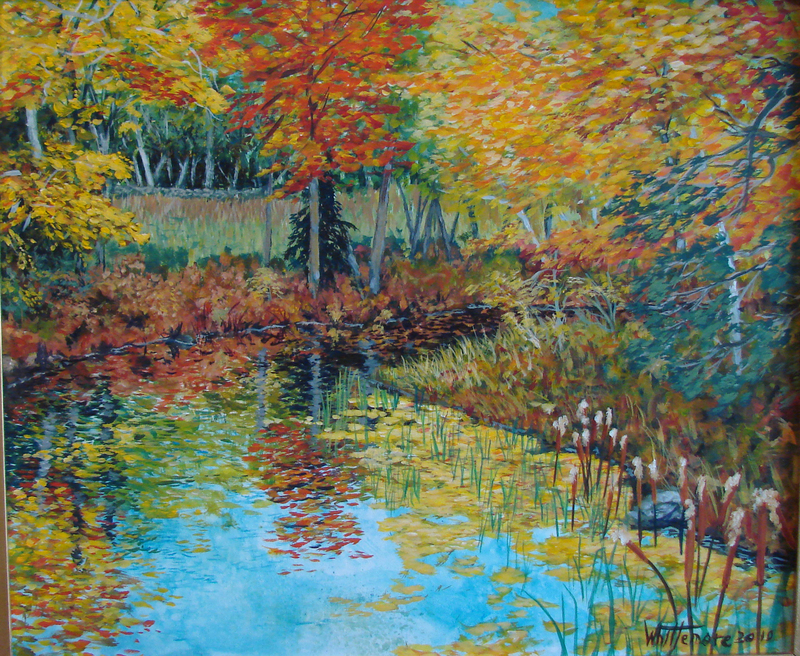 This day, the wind was blowing and the multi-colored leaves and waters surface were shimmering with a riot of color. I took a dozen shots, and choose the photo below for the work. For this painting, I wanted to experiment with a loose and quickly done style that reflected the visual and atmospheric impression my eyes saw. I wanted to paint this scene quickly. I used very loose slashes, dabs and dabs of color on a very smooth, toned canvas. 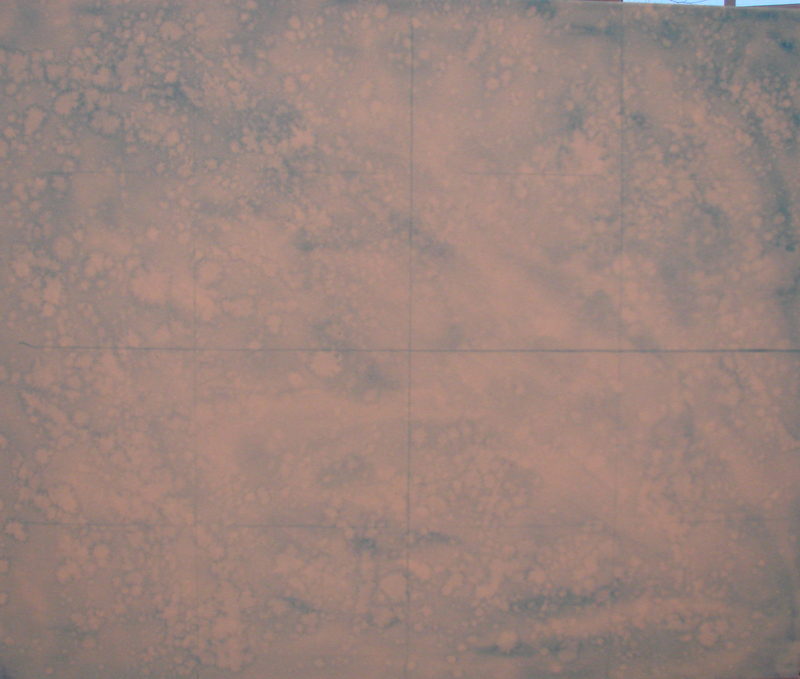 I prepared the surface using the steps under the tab on Surface Preparation. (Insert link to Masonite Panel Preparation). Using thinned cerulean blue, I drew two light blue lines on the 24 X 20 canvas, dividing it into fourths. I toned the surface by laying the canvas flat on the work table and wetting it thoroughly with a fine mist. I used a two ounce spray bottle of water with a few drops of dishwashing detergent in it (insert link to tabs for tools and methods). I want to cover the whole surface with a thin layer of standing water. I quickly applied a thin wash of cerulean blue, and a touch of cobalt blue in a random wash using plenty of water. I want to float the wash over the whole surface in an uneven layer of paint. I let this dry a minute or so, but I didn’t let it dry thoroughly. I used the hair drier to help dry the surface and evaporate some of the larger puddles of water. I also dabbed off large puddles of water with a crumpled rag. Before the surface dried too much, I set the nozzle of the eight ounce spray bottle for a coarse, slightly drippy spray. I then held it high above the canvas and sprayed it so full drops of water and misty water fell on the surface. In some areas, I dipped my fingers in a jar of (soapy) water and flicked larger drops on with my finger tips. These drops of soapy water cause the paint to migrate to the edges of the droplets. This makes an interesting pattern as shown in the photo below. Using the hair dryer again, I held it fairly high and pointed it straight down at the flat canvas. I continued to dab off larger puddles and tried to dry the canvas evenly. 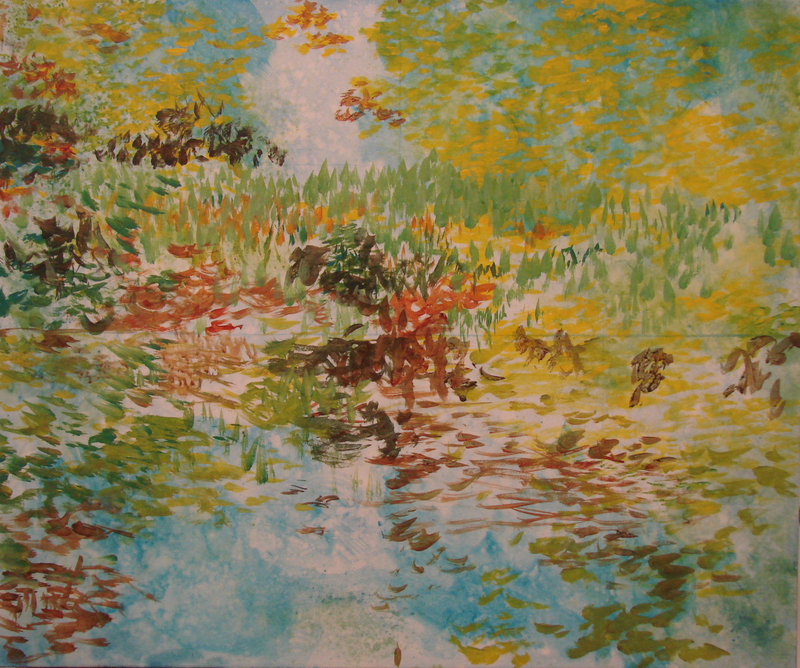 Some adjustment or intensity of color can be made at this point, if I keep the surface at least damp. When this was thoroughly dry, I laid the canvas flat and rewet the surface. 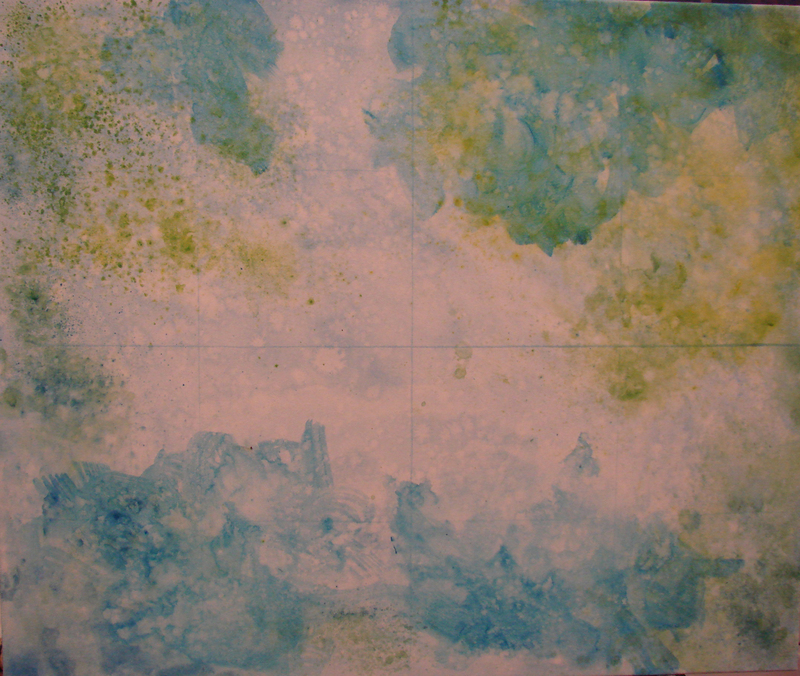 I added more cerulean blue and cobalt blue to strengthen the sky and water, then mixed cadmium blue and cadmium yellow. I used that to wash some green on the top left and right sections where the majority of leaves will end up. I then flicked more soapy water over the surface. I let it dry a short time and again, sprayed it with an eight ounce spray bottle. I dabbed up large puddles and continued with the hair drier until dry. I am working to get a mottled appearance for a base color/tone before brushing in the under-painting. Incidentally, this is the way I start all of my paintings. When this dried, I placed the canvas on the easel. I then began adding yellows, reds, greens, burnt umber and raw sienna in random dabs, slashes, and strokes in different directions to block in the major elements. I left the blue foreground and parts of the sky visible for the time being. You can still see the blue lines that divide the canvas into quarters at this point. This is a very busy scene, and I found it easy to lose direction as I built up color and texture over the canvas. I found it helpful to focus on one quarter of the canvas at a time. To do this, I put four thumb tacks into the back, between the mid points of the stretchers, and placed a couple of long rubber bands stretched across the face of the canvas. I drew one horizontal and one vertical line across the center of the 8 X 10 inch photo that matches the blue lines on the canvas. I used a piece of cardstock and cut a rectangle large enough to expose exactly one quarter of the photo. The photo and mask are held together with a couple of paper clips, and it’s easy to flip the mask over to expose all four of the sections of the photo in turn. I used a small plastic clamp to hold the photo/mask in any position on the stretchers while painting. By blocking out three quarters of the photo with a paper mask, and focusing on the color and pattern of reflected light my eyes perceived in the opening of the mask, it was much easier to build up the overall structure of the painting. I kept flipping the mask around the photo, and built up color evenly in each quadrant. When I painted close to the elastic band, I just pulled it aside to add some paint. By this time, I didn’t need the mask, as the large areas of color and shape were well-established. I added a river bank to the right side, a rock and some cat tails for some visual interest in the foreground. This painting was a departure from my usual method of working, and was a quick, easy painting to create. Trying different approaches and methods is always a lot of fun. Sometimes it doesn’t work out well, and other times, it does. In either case, I always learn something useful. If it doesn’t work out well, get out the gesso and start over. I’ve lost nothing but a little time and a few cents worth of paint. Of course, this is my favorite.. 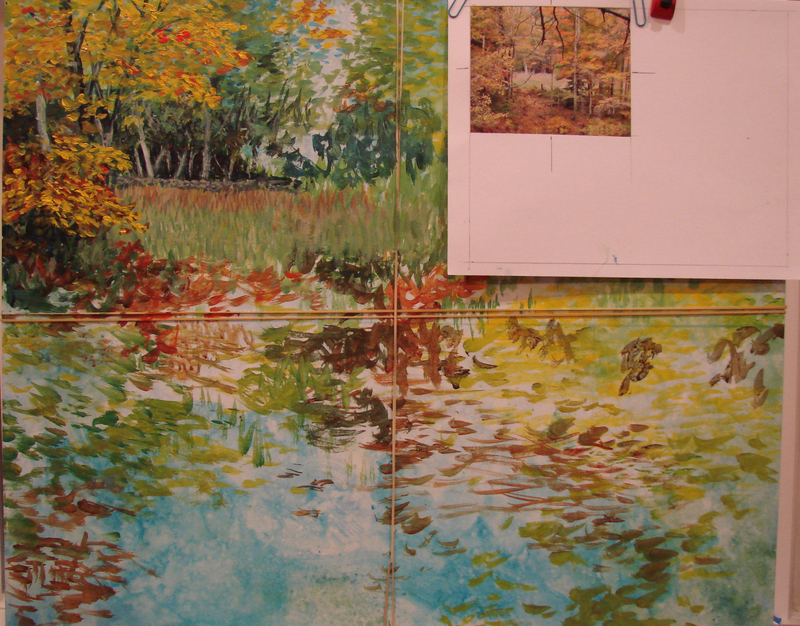 I am very impressed with your website, especially when I saw my painting in progress.